This 2 in. 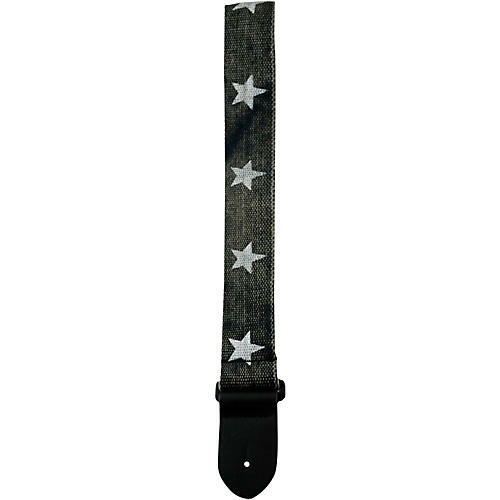 wide grey distressed cotton guitar strap with printed stars and leather ends is adjustable from 39 to 58 in. long. Made in Canada. The guitar strap: not just a fashion accessory and not just a rock-and-roll accoutrement. The guitar strap connects you to the heart of your expression. Perri's Leathers knows the essence of a great guitar strap. They have designed and finely crafted guitar straps for over fifteen years. The family business combines the expertise and experience needed to produce unique, beautiful and functional guitar straps. Lou Perri, original owner, artist, musician and patriarch, Anthony Perri, innovator and son - together they put the soul into each guitar strap they create.